Hi Friends! I hope you aren't like me rushing around and not accomplishing much! I enjoy the Holidays, but this year I am really not on my game. I hope that gets better soon. Today I have a birthday card that I would like to share with you. I have been needing to use this set for some time now and I finally did it this week and now I regret that I waited so long to do so. When I first saw this set in the Annual Catalog I knew I had to have it. It is such a fun set. The set is called Topsy- Turvy Celebration. I needed a birthday card for a very special someone and this set came to the rescue! I think it's a fun card. What do you think? 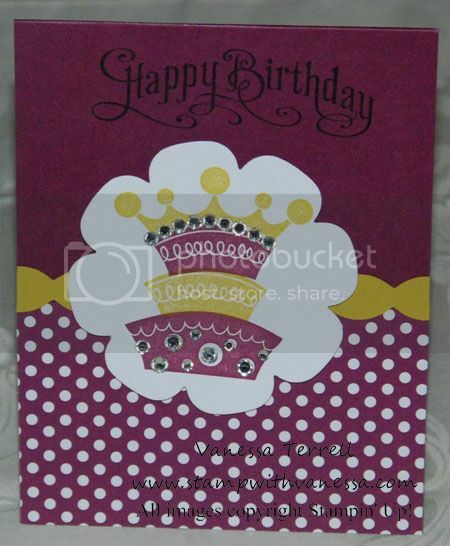 The person receiving this card likes purple, so I used purple and lots of bling. I hope she likes it! Thanks for stopping by, time to go work on those Christmas cards! Click here to place a Stampin' Up! order.